Spanish technology satellite. The Minisat spacecraft were built for the Spanish space Agency by CASA. Experimental satellite built by CASA for INTA, Spain. Launched 1997. Used Minisat-0 Bus. Status: Operational 1997. First Launch: 1997-04-21. Last Launch: 1997-04-21. Number: 1 . Gross mass: 209 kg (460 lb). 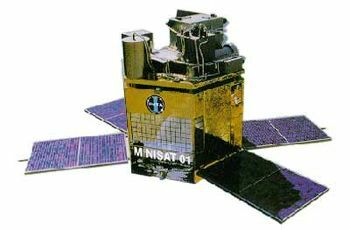 The first series were Minisat-0 technology satellites, to be followed by Minisat-1 observation satellites and Minisat-2 communications satellites. The Minisat-01 carried the EURD extreme ultraviolet spectrograph to study interstellar gas, the LEGRI gamma ray burst detector, and the CPLM microacceleration in liquids experiment. Family: Medium earth orbit, Technology, Technology satellite. Country: USA. Launch Vehicles: INTA, Pegasus, Pegasus XL. Launch Sites: Gran Canaria DZ. Agency: CASA. Bibliography: 2, 4, 12839.